Sunshine drifts thru huge windows. Bliss can be yours in the bubbling hot tub or jetted bath tub. Fire up the gas grill. Get away from it all and be entertained with HDTV, Wi-Fi, and a Wii or venture into town and explore! Just Like Bearadise is a mountainside log cabin with amazing views. No need to rough it in the mountains. This cabin has all the amenities of home. 3 Bedrooms & 3 Baths. The downstairs suite bedroom has a king-size bed, satellite HDTV, a gas fireplace plus an alcove with a Full/double size sleeper sofa, a mountain view, and access to the deck with the hot tub. The downstairs bath has a dual vanity and combination shower and jetted bath tub. The main floor bedroom has a queen-size bed and a mountain view. There is a full bath across the hall. The open loft bedroom has a queen-size bed, a mountain view, and a private full bath. The kitchen includes granite countertops, stainless steel appliances and all the necessities. Two gas log fireplaces set the mood for getting cozy or warming you up while watching one of the two HDTV’s with DirecTV and DVD player. On the lower deck enjoy privacy in the hot tub while overlooking the amazing view of the Smokys. On the upper deck take pleasure in the views with plenty of seating for all and grilling out. Additionally, for those of you who like to stay connected we offer the high speed wireless internet. We had a group of 50 spread over 7 cabins and Cathy, Kelly, Melissa are Rock Stars!!! Their attention to our large group and accommodation of our myriad of requests were met with a smile and can do attitude. No request too big or Small was put off. Their response was immediate and we couldn't be more pleased. Maggie Hutchison has the best team from the office to the maintenance team and the cleaning crew. We will not hesitate to recommend GSCR to any and all that want the perfect getaway in NC. I was impressed that the staff called to make sure we had arrived safely. When she called, we had not left for the cabin yet (some commitments at home), but the directions were great and we found the cabin even in the dark! The booking process was very easy. I mentioned what area I would like to stay in, and cabin suggestions were emailed to me right away! 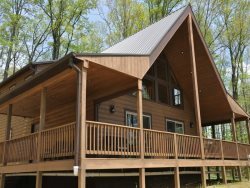 Just Like Bearadise is an amazing cabin! It includes many amenities from home. The views are just spectacular. Waking up and having your morning coffee on the deck is just breath taking! The hot tub is a nice addition to have after a long day of hiKing or kayaking. The only set back is the wifi. It is very slow, which is understandable for being in the mountains. However, when having an IT person as your husband, it's a big set back. The view and cabin was just beautiful and very relaxing. Great Smokys Rentals is consistent and great to deal with... Manager Response - Sep 30, 2013: We are delighted to hear that you liked Just Like Bearadise Cabin. Thank you for the great review. We look forward to seeing you again. As a repeat guest you will receive a 10% discount. We had originally reserved a different cabin, but arrived to a power outage in that area. The staff was so helpful. Mike met us and personally led us to our new cabin (which was amazing) and Maggie (and the rest of the staff) went above and beyond to make us feel at home and well taken care of. Our mini vacation was awesome!!! Thank you for everything!!! Just like Bearadise was just like paradise....everything was great. Have reccomended it and will continue to reccomend it. We will definitely be returning and look forward to our next trip. Thank you for letting us call "Beardise" our home for the short time we were here. We love coming to the Smokys to get away and this was a perfect spot to escape. We had two days of a beautiful winter wonderland. Still snowing as we are packing to leave. We'll see you in the Spring. Thanks for sharing "Bearadise" with us! The views are amazing and the cabin is great! We stayed here the whole time without leaving. Enjoyed the hot tub, grill and playing board games & just having our time together has made this trip wonderful. Thank you. Autumn leaves on fire at sunset. We drove the Blue Ridge Parkway, Cherohala Skyway, biked the trails in Deep Creek (Amazing). But the best view is right outside the cabin, makes me feel so blessed to be here. You do have a piece of "bearadise" on eath. Thank you for sharing your beautiful cabin with us! The cabin is great and the views are amazing. The leaves are changing and the sights are spectacular. A very relaxing place, we never want to leave. Also, thanks for being dog friendly, Copper had a great time too!